I love when Cherry Culture has their 20% off sales. You can always count on them to have one at least every two months. What I like about Cherry Culture is they offer some small and sometimes unheard of nail polish brands like L.A. Colors, L.A. Splash, L.A. Girl, and NYX. The great thing about these brands is they have awesome color selections and are usually in the $2.00-$4.00. I picked up this L.A. Girl color during their last sale. Hustle is a bright royal purple creme. 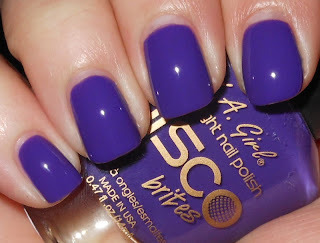 This part of the Disco Brites collection, which has around 24 shades. These are black light polishes, but I do not have a black light to test it out. This polish is vivid and bright. I am so in love with it. If you're a fan of colors like China Glaze Grape Pop, you will love this one. It more vibrant Grape Pop. This was $2.50 on Cherry Culture, but I really recommend you wait until they have another sale. I plan on picking up more from this collection because I cannot get enough of bright colors like this! This is such a great color!! I really need to check out Cherry Culture's site. Nom that colour is so stunning! Oh no... :( Blues are my favorites! Yes you do! They have so much nail polish on there. I absolutely love purple polishes and this one is no exception; really pretty. Awesome shade! I also wonder how vivid it is under a black light. It would be fun to wear this if you go for glow-in-the-dark bowling!